The enlarged ע ayin at the end of שמע Sh’ma (Hear) and the enlarged ד dalet at the end of אחד echad (one) combine to spell עד eid (witness). We recite the Sh’ma to bear witness to the Oneness of God. While the Shema tells us directly to ‘hear’, the indirect message is that it is not enough to just listen. We must also witness, an act that involves every one of our senses. 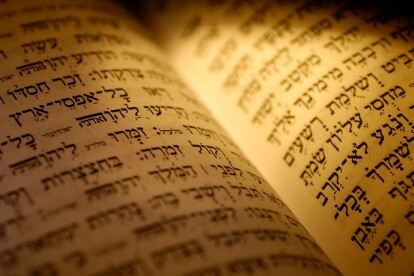 The Shema does not end with the command to be a witness. The connecting V’ahavta readings tell us that we must put what we have learned into practice. Place these laws on our doorposts, our gates, even our hearts, and then teach them to our children. A witness, then, is a person who hears, sees, and experiences, and then shares those experiences with others, especially the next generation. The Center for Holocaust and Humanity Education educates about the Holocaust, remembers its victims and acts on its lessons. Through innovative programs and partnerships, CHHE challenges injustice, inhumanity and prejudice, and fosters understanding, inclusion and engaged citizenship. The goal of remembering the victims of the Holocaust is becoming even more important as survivors become older and can no longer bear witness for themselves. Soon, there will be no one left to share first-hand experiences of the Holocaust. the world did know [about the Holocaust] and remained silent. And that is why I swore never to be silent whenever and wherever human beings endure suffering and humiliation. We must take sides. Neutrality helps the oppressor, never the victim. Silence encourages the tormentor, never the tormented. Wiesel spent his life fighting the silence of indifference. He fought to ensure that other survivors could bear witness and remind the next generation of the dangers of silence. He helped to found and fund organizations like the United States Holocaust Memorial Museum in Washington, DC, and even the Center for Holocaust and Humanity Education in Cincinnati. Wiesel’s work also focused on human rights concerns around the world, including apartheid in South Africa and the Sudanese Genocide. Wiesel’s work as an educator in universities, as an author of fiction and nonfiction, and as an activist encouraged millions around the world to stand up for victims of genocide. The Early Warning Project produces risk assessments of the potential for mass atrocities around the world by combining state-of-the-art quantitative and qualitative analysis. The project aims to give governments, advocacy groups, and at-risk societies earlier and more reliable warning, and thus more opportunity to take action, before such killings occur. There are currently three countries — Myanmar, Nigeria, and Sudan — at high risk for ‘state-led mass killings’, also called genocides. These three countries will be monitored by partners of the Early Warning Project, and reports will be made to educate the public about the atrocities against minority groups in these countries. For example, in 2015 the Early Warning Project reported that Myanmar was holding “the first ‘relatively free’ election in the country’s history” but the targeted minority group, the Rohingya, were unable to participate. From the charts shown on their website, the Early Warning Project seems to show a decrease in the likelihood of a mass killing between January 2015 and January 2016. The data given about Myanmar shows that there is a link between survivors of past genocides and victims of ongoing mass atrocities. When Holocaust survivors bear witness and when we, later generations, pay attention to their experiences, we can stand up and prevent future genocides. This is the work that the Center for Holocaust and Humanity Education is performing. By bearing witness, by acting as an עד, organizations like the Holocaust Center act as the link between the Holocaust of the past and the humanity of the future. Elyse D. Frishman, Mishkan T’filah: A Reform Siddur: Weekdays, Shabbat, Festivals, and Other Occasions of Public Worship (New York: Central Conference of American Rabbis, 2007), 233.